I read this article and found it very interesting, thought it might be something for you. The article is called Helping cure smallbiz headaches and is located at https://www.rocketlawyer.co.uk/blog/rocket-round-up-helping-cure-smallbiz-headaches/. Cutting out the commute can help home based entrepreneurs to pack much more work into a day but does this make them more successful? Entrepreneurs who work from home talk to Guardian Small Business about their experiences and offer top tips on time management. One of the biggest headaches for small business is late payment. In fact, over £30 billion is owed to small businesses in outstanding debts. RLUK VP and General Manager Mark Edwards blogs this week on the problem and how Rocket Lawyer UK can help. We have guidance on our quick guide to payment reminders and late payment letters in our suite of business documents. Even if your business is on a tight budget, entrepreneurs agree that marketing is a must. Enterprise Nation offer five bits of good practical advice on maximising your marketing investment. Speaking of good practical advice, StartUp Donut published useful guidance on what small businesses need to consider when it comes to National Insurance and Tax including tax allowances and VAT. 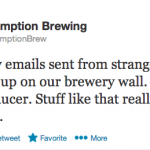 As Bill Gates once observed “Your most unhappy customers are your greatest source of learning,” but never underestimate the power of positive feedback to a small business to motivate and encourage them, as we were reminded this week by a tweet from small Tottenham-based brewery, Redemption Brewing. In property news this week, PM Law’s Harvey Harding writes on Government plans to allow longer tenancy agreements. Rocket Lawyer UK offer a suite of documents relating to property on our business pages, including tenancy agreements for buy to let owners as well as Quick Guides to many aspects of letting out property. In the digital age where so many people have a whole life stored online, is it time for people to consider digital wills alongside the ordinary will ? BBC News discuss the options already available for ensuring all your digital information can be accessed in the event of your death. If your company isn’t on Google +, should it be? Mashable look at the pros and cons for a business of setting up a page and what needs to be considered if you decide to go for it. 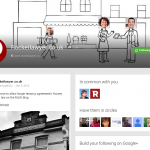 Incidentally RLUK have a Google+ page. We’d love it if you added us to your circles.